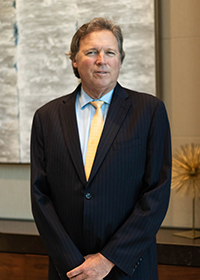 Nathan E. "Nat" Nason is a shareholder in the law firm of Nason, Yeager, Gerson, White and Lioce, P.A., where he has practiced complex commercial litigation and environmental law for over 30 years. He received his B.S. in finance from Florida State University and his J.D. from Duke University, where he graduated with honors. Over his career, Nat has procured numerous multi-million dollar judgments and settlements. He is rated "AV" by the independent lawyer rating service Martindale Hubbell, which is its top rating. Born in West Palm Beach, Nat takes full advantage of the great amenities in our area. He is an avid fisherman and scuba diver, and enjoys getting over to the Bahamas when time permits and weather cooperates. And you might just catch him playing guitar in a local bar or at the beach- signs of a misspent youth. Nat strongly believes that we should all give something back to the community. He has volunteered countless hours of community service (no- not because he was ordered to, but because he thinks it's important ;^), and is both a former Chairman of the Northern Palm Beach County Chamber of Commerce and a past president of the West Palm Beach Rotary Club. Nat spends his free time with his wife, Mary Lou and his son, David.